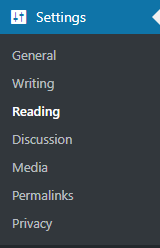 The Reading Settings control how your blog is displayed to visitors. You can access it via your Settings -> Reading page. The Your homepage display setting allows you to choose what content appears on your site’s front page. You can choose to have your latest blog posts or a static page that you have created in the Pages section of your site. Setting a higher number of posts to display on each page can potentially impact load times on your blog, since you will be loading more data with each page. The default setting is 10 posts per page to ensure faster load times. Syndication feeds show the most recent __ items lets you set how many blog posts will be sent out at once via your RSS feed (located at https://np-sites-app1.temple.edu/your-site/feed/). For each article in a feed, you can select Full text or Summary. Full text means that the entire contents of a post are included in the feed. Summary means that only the first 55 words are included in the feed, along with the option to continue reading the rest of the post. This setting also affects what users receive in their RSS subscriptions. Site Visibility control who can and cannot view your blog. Please see Managing Site Privacy for more information on these settings. If you receive an error message on the front page of your blog that no content was found or that we weren’t able to locate the page that you’re looking for, then that means that your front page is configured incorrectly. Your front page is set to display your most recent posts, but you haven’t published a blog post yet so there is nothing to display on your front page. You can correct that by publishing a new blog post. To do that go to Posts -> Add New and start writing! Your front page is set to display a static page, but you either didn’t specify which page to display in your Reading Settings, or the page that you chose isn’t published (it’s either deleted or saved as a draft). To correct that, check your Front Page Setting to make sure you selected a page to display that is published.